Written by Piret Kuusk, Mihkel Rünkla, Margus Saal, Ott Vilson, researchers from the Institute of Physics at the University of Tartu, Estonia. 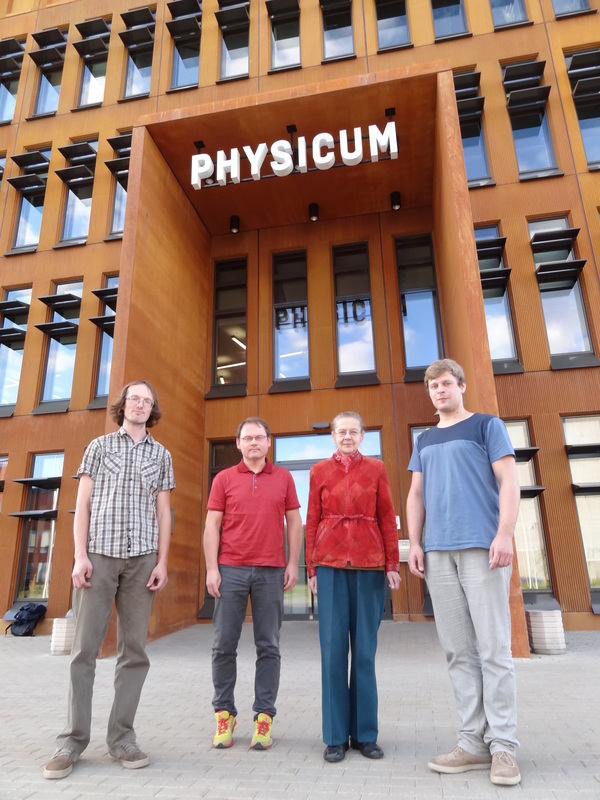 The authors in front of the building of the Institute of Physics, University of Tartu, Estonia: doctoral students Mihkel Rünkla (far left), Ott Vilson (far right), senior researcher Margus Saal (center left), head of the Laboratory of Theoretical Physics Piret Kuusk (center right). Working in the field of cosmology one deals casually with modified gravity. Modifications can be small or large. Sometimes a small modification of the theory could cause a large effect. It is also possible that large modifications do not affect the predictions of the theory at all. The concept of cosmological inflation can probably illustrate both of these situations somehow. Adding a short period of inflation to the evolution of early universe seems as a small modification of the theory. This modification in turn has a large effect as it solves the horizon and flatness problems. In the simplest case inflation is driven by an additional scalar field with a suitable self-interaction potential. During inflation potential dominates over the kinetic term of the scalar field giving rise to a slow roll. Dealing with slow-roll inflation can illustrate the second aforementioned situation: slow-roll can be incorporated in different theoretical frameworks not affecting the universal predictions of slow-roll. Although the predictions of slow-roll inflation are in some sense universal, the observational data can still invalidate some specific models. One can read sentences as “minimally coupled inflation is ruled out”, which invite us to consider non-minimally coupled theories using the framework of scalar-tensor theories. Minimally and non-minimally coupled theories differ as in the latter case, the scalar field is no longer in the role of a matter field, but it acts as an additional mediator of the gravitational field. Generically the scalar field is sourced by the trace of the energy-momentum tensor, hence the term non-minimal coupling. Introducing a non-minimal coupling only in the gravity sector, while preserving the usual form of the action for the matter fields, defines the theory in the Jordan frame. However, the action for scalar-tensor gravity is imposed to be invariant under conformal rescaling of the metric and under redefinition of the scalar field. Thus, one can perform calculations in different parametrizations, each of which is related to some other via particular transformations, and obtain mathematically equivalent results. Performing these transformations the action can be presented as a direct sum of Einstein-Hilbert, the action for the scalar field and the action for the matter fields, which in that case depends on the scalar field as well. Now the theory is said to be in the Einstein frame where scalar and metric gravity are minimally coupled. During inflation, one considers the contribution of matter to be negligible, hence the non-minimal coupling between the scalar field and matter in the Einstein frame does not matter. Thus, from the perspective of inflationary dynamics it is indistinguishable if the scalar field is minimally or non-minimally coupled. If one claims the equivalence of different conformal frames, then one has to find the correspondence between observables in different frames. This motivates us to define invariants – quantities that are not affected by the local rescaling of the metric. More details on invariants can be found in our paper Invariant quantities in the scalar-tensor theories of gravitation. It indeed turns out that under certain premises spectral indices describing perturbations in Jordan and Einstein frames are invariant up to second order in slow-roll parameters, which are defined via invariants as well. Hence, it seems that modifying the viewpoint – transforming from one frame to another – does not affect the predictions of slow-roll. However, there are quantities such as the number of e-folds and the scale of inflation that are different in different conformal frames. So a question remains if these quantities being frame-dependent are not directly physically measurable and should be interpreted only in a particular setting (e.g. in the Jordan frame where matter follows geodesics). General relativity explains well the behaviour of planets in the scale of the solar system. Hence the modifications of general relativity should be small here and now, which motivates to consider the general relativity limit of scalar-tensor gravity. It is known that general relativity can be an attractor in the scalar-tensor theory. It has also been established that the general relativity limit has an invariant meaning – the motion towards general relativity occurs both in the Jordan and Einstein frames. For more details read our previous paper in Classical and Quantum Gravity: Transformation properties and general relativity regime in scalar-tensor theories. Scalar-tensor theories are often described as minimal modifications of general relativity. To find out how slow-roll inflation is affected by considering it in the framework of a general scalar-tensor theory, we kindly invite the reader to consider our recent paper Invariant slow-roll parameters in scalar-tensor theories where we have studied slow-roll inflation in different frames using invariant formulation. This entry was posted in Author Insights, IOPselect and tagged cosmology, inflation by Jennifer Sanders. Bookmark the permalink.